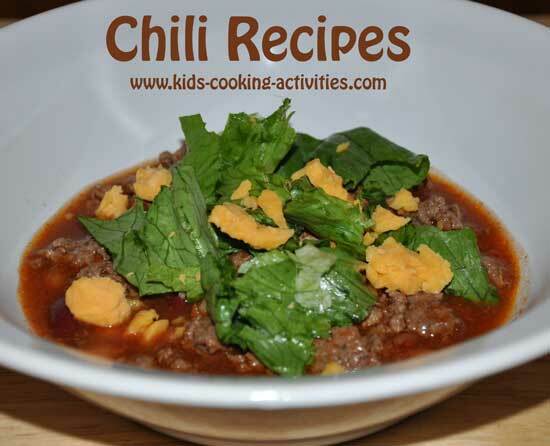 Here are two of our favorite chili crockpot recipes. Both work well in the crock pot, and freeze well. They can easily be prepared ahead of time and stored in the fridge or freezer. 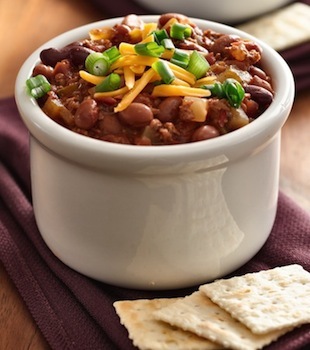 Don't forget to share your favorite easy chili recipes below. 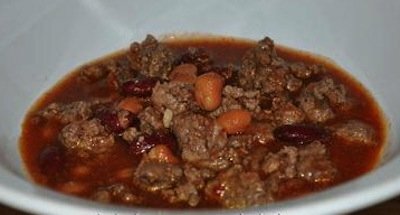 For these chili crockpot recipes you can use ground beef, ground chicken, pork, a combination, etc. 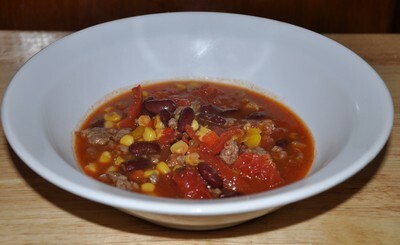 Mix soup ingredients together and cook in the crock pot or on the stove for 30 minutes or less. Serve with toppings below. ~ I often puree any vegetables I have on hand like zucchini or carrots and add it to the soup. It thickens the soup as well as adds more flavor and nutrition. In large pan cook hamburger and grated onion until hamburger is browned. Drain and wipe pan with a paper towel. Add hamburger back to pan. Add diced tomatoes, tomato sauce, chili powder, cumin, seasoning salt and beans. 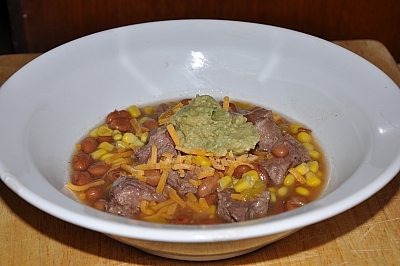 Cook in a crockpot or on the stove at least 30 minutes. Before freezing allow to cool and portion into freezer containers. If using dried beans, place in a bowl and pour water to cover. Let sit overnight. Grate one onion in a frying pan and brown beef with onion. Drain and place in crock pot. Add in chopped carrots, black eyed peas, water, bouillon cubes and pepper. Stir and cook on low 8 hours. In skillet brown hamburger and sausage. Season with salt and pepper and drain grease off. Pour into crockpot. Add in beans, beef broth and tomatoes. Add in garlic, bay leaves, chili powder, brown sugar and tomato paste. Cook 4-6 hours on high or 6-8 on low. You can cook these Chili crockpot recipes on the stove if you'd rather. You can mix & match this recipe for what protein you have on hand (or what your kids are more likely to eat!) and includes a lot of veggies. 1) Bring broth, taco seasoning, onion, lime juice, & tomato soup to boil. Add meat, reduce to medium high. If using beef, simmer 10 minutes. If using chicken, cook until done, then shred & return to pot. 2) Add beans & tomatoes. Simmer 30 min. 3) Add peppers & corn. Simmer until tender. Top with shredded cheese, sour cream, guacamole, or tortilla chips. This makes a big batch of soup, and freezes well. 1 can (14 oz) diced tomatoes, puree if you don't like chunks of tomatoes like my kids don't. In a skillet saute ground beef with 1 grated onion and 1 garlic clove. Drain and add to crock pot. Stir in tomatoes and beans. Season with chili powder and add water. Stir until well combined and cook 6 hours on low. Place chicken, tomatoes, beans and seasoning in crock pot. Add water and stir to combine. Cook on low or high 6 hours. Serve with shredded cheese, sour cream and tortilla chips if desired. Saute onion and garlic in oil. Add chicken and continue to cook until chicken is no longer pink. Cook in crock pot 4-6 hours on low. Serve with tortilla strips and cheese, if desired. 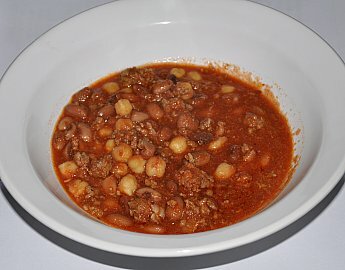 What is your favorite chili crockpot recipes?